The Medium Combustion Plant Directive (MCPD) forms part of the EU’s Clean Air Policy and fills a regulatory gap between small and large combustion plant, targeting emissions from combustion plants of between 1 and 50MWth input. The MCPD is in the process of being transposed into UK law. By December 2017, the MCPD will be implemented in England and Wales by an amendment to the Environmental Permitting Regulations. The new legislation will require operators to obtain and comply with the conditions of an environmental permit if they operate combustion plant with a thermal input in the 1-50MW range with some exemptions. In this technical briefing, SLR outlines the key issues for affected organisations. SLR has been involved in Defra’s working group on the transposition of the MCPD, and co-authored the Institute of Air Quality Management’s response to the consultation. It is anticipated that there are c. 10,000 existing MCPs in England and Wales affected. Organisations large and small will be affected. The cost to organisations with multiple plant and multiple operational facilities will be greatest. Small business will proportionally be most impacted. The cost of fitting abatement, technology switches, undertaking monitoring, ensuring compliance and administration is anticipated to total £386.5m over the period 2018-2032 (Defra, 2016). With an estimated 10,000 existing plants to be affected, the average cost per item of plant is expected to be in the region of £38,650. 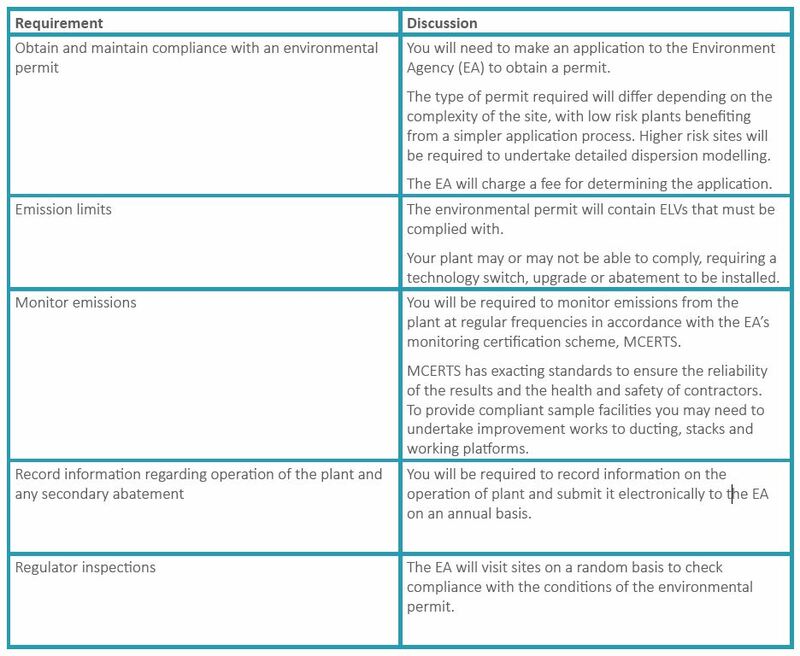 For ‘generators’ (combustion plant which generate electricity) DEFRA intends to bring forward the compliance date for plant which operate for >50hrs per annum (including testing) or export electricity to the grid. What do I need to do if my organisation operations combustion plant in the 1-50MWTH input range? While the timeframes for ‘existing’ plant to comply mean it will be in the back of the minds of some, SLR recommends in particular organisations with multiple operational sites and a significant number of affected fixed assets get to grips with how the new legislation will affect them. Acting early will enable organisations to forecast their capital expenditures to soften the impact and provide a smooth transition in making the necessary upgrades to obtain compliance. • Undertake air quality dispersion modelling. SLR is developing a user friendly software tool for assessing combustion plant’s compliance with the legislation and identifying applicable environmental permitting requirements, ELVs and monitoring standards. The tool will save significant time and money associated with undertaking compliance assessments. The output will identify areas of non-compliance to enable feasibility studies of the available options to be undertaken. A number of exemptions from the need to obtain an environmental permit apply. These apply to combustion plant used in particular sectors or for particular purposes, for example recovery boilers within installations for the production of pulp. A number of exemptions from ELVs listed in the MCPD apply also. For example existing plant which do not operate more than 500 hours per year as a rolling average over 5 years and new plant which do not operate more than 500 hours per year as a rolling average over 3 years will be exempt from ELVs.